Marshall biology professor Jayme Waldron has received a grant to continue studying the eastern diamondback rattlesnake. One Marshall University professor’s research is pretty unique. She’s examining the eastern diamondback rattlesnake, which isn’t in West Virginia. The research will take her to the Marine Corps training base in South Carolina. 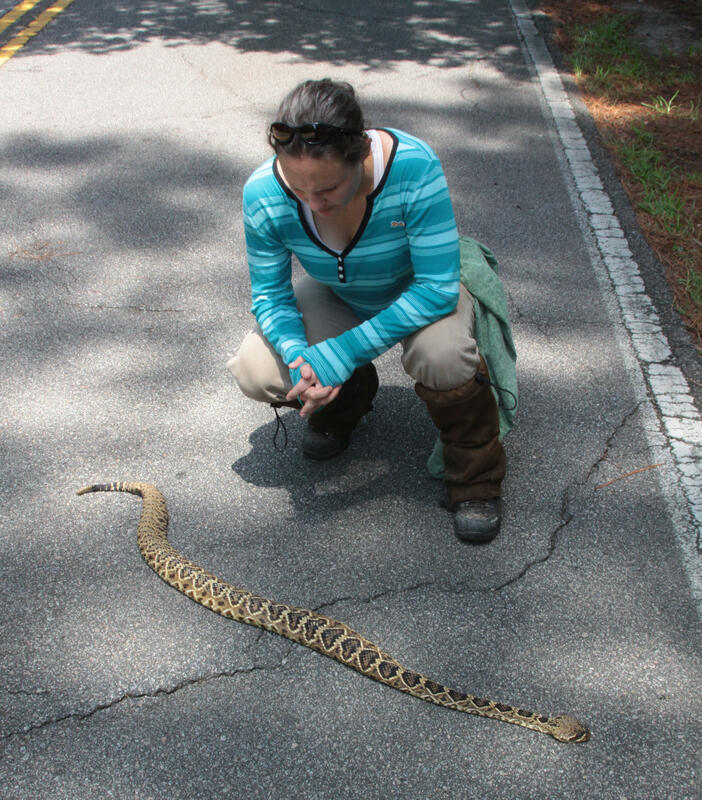 Dr. Jayme Waldron gets a close-up look at a rattlesnake as it crosses a road. Jayme Waldron is an assistant professor of biology and conservation biologist. As a Marshall University undergrad she took part in studies looking at salamanders. That research took her to South Carolina where she gradually looked at reptiles and then rattle snakes. “Did research for my dissertation at Clemson University and I never stopped, kind of got obsessed with it, but they’re fascinating creatures that are horribly misunderstood,” Waldron said. “They’re really not that scary, don’t get me wrong you should respect them, but they’re not out to get you, they try to avoid people,” Waldron said. Waldron’s newest research project will allow her and a team of researchers to continue looking at eastern diamondback rattlesnakes at the Marine Corps Recruit Depot at Parris Island in Beaufort County, South Carolina. There she’ll look at effects of military land use on the rattle snakes. The Marine Corps often changes the base’s landscaping for various training exercises. The Corps wants the research done to try to prevent any encounters with the rattlesnakes while also making sure they’re not threatening the eastern diamondback population. She said what they’ve found is unique. Due to declining numbers and widespread loss of habitat, the species of eastern diamondbacks are under review for possible protection under the Endangered Species Act. So the question is -- how does she and her team catch one? The answer is -- very carefully. Waldron has been studying the area since 2008, but the most recent $87,800 grant from the U.S. Department of the Army allows her and a team of researchers to continue to track the snakes. For the study Waldron said they’ll conduct mark-recapture surveys and use radio telemetry to monitor free-ranging diamondbacks over a period of two years. They will also monitor the vegetation associated with how the marine uses the land. Waldron said the eastern diamondback can’t be found in West Virginia, but timber rattlesnakes can be found here. The eastern diamondback’s habitat is in the southeastern part of the U.S. along the coasts of North Carolina down through Florida and along the Gulf Coast, including on several U.S. Department of Defense Installations. Waldron said there research will be used in different ways. Waldron says the results will be used by other military bases on the east coast and along the gulf in how they deal with the snakes and their training practices.